There is very little about Eileen on the internet but if you search you will come across a few on-line links which are listed below. The obituary by Emmanuel Cooper is warmer than the Guardian’s piece which is perhaps a little impersonal. Both are from 2005. Eileen was the co-founder of Briglin Pottery along with Brigetta. According to Anthea Arnold’s book Eileen departed Briglin Pottery in 1958 after only ten years. She left the pottery in the hands of Brigetta. Eileen is perhaps best known for starting the Ceramic Review Magazine along with Emmanuel Cooper. She continued to produce ceramics after leaving Briglin. Her works are not numerous but they can be found. 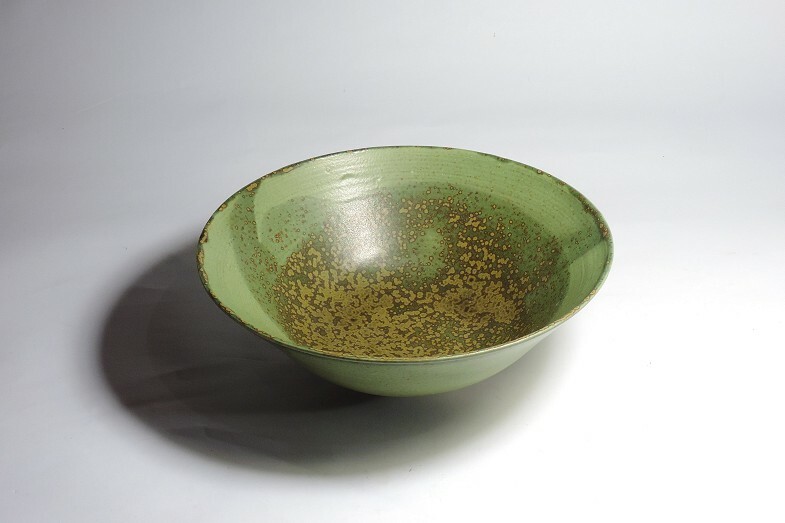 I have a few examples with the green dish being very finely made and perhaps the best piece. I assume that the tall vase I have is early and produced before she moved to porcelain and the works became precise. I say this because of the groggy clay and the muted colours which remind me of early Briglin and that is does not carry the impressed wave mark. That vase is monochrome, but dirty monochrome, not clean or pure. It’s miles away from the Porcelain stuff. The bowl is probably later – 70’s as it matches the dated pieces above in the Aberystwyth Ceramic Collection. I’m assuming that the wave mark dates pieces to the post Briglin era? guess? Eileen Lewenstein – Imaginative potter who launched the Ceramic Review – Tanya Harrod, the guardian. Eileen Lewenstein – Aberystwyth Ceramic Collection. Eileen Lewenstein – V&A Search the Collections. EL – Green Dish – 70’s (?) green porcelain dish. EL – Transition Vase – Groggy (?) tall vase possibly early? 50’s? EL – Porcelain Forms x2 – Deformed porcelain forms, date? EL – Porcelain Vase – One of the small scared vases, date? Here are two photos of her impressed mark. It is a roughly square impression, with an EL centre top. Underneath the EL are two wavy lines which seem to represent water. 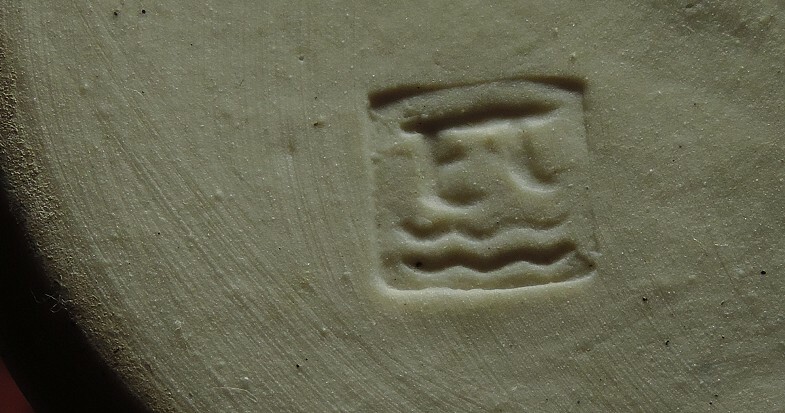 From ebay – this mark is quoted as being in use in 1979… Clear Potters ‘EL” seal to base – see photo..Provenance: Private Collection Brighton, Bought c1979… so I would assume the wave mark is late and EL on it’s own earlier. 05.07.2014 Update. I finally got around to buying a copy of the British Studio Potters Marks – by Eric Yates-Owen & Robert Fournier (p.305) and they state that the early mark is sometimes a painted EL, from 1959-, or an impressed EL 1959-1975. The wave EL is used from 1976- . All the information I have agrees with this. Eileen Lewenstein mark – this first one is very clear, and you can clearly see the fineness of the grain of the porcelain. 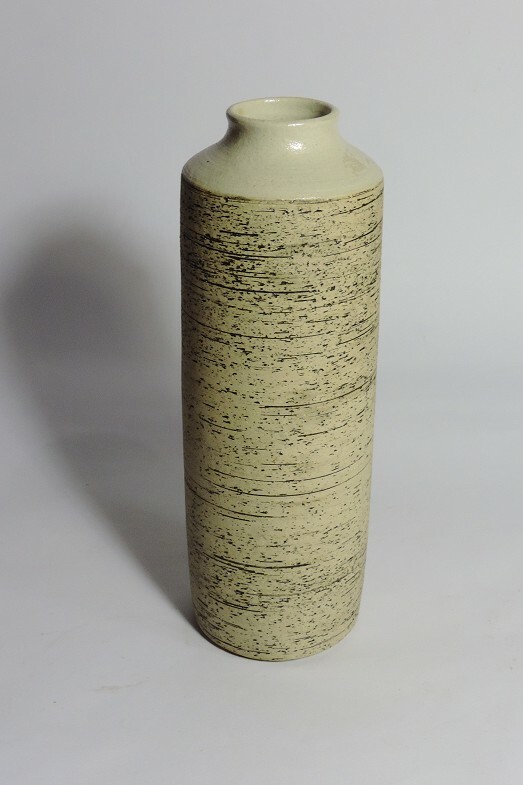 Eileen Lewenstein mark – Exactly the same impressed mark obscured by the glaze, this is quite common. I’ve recently updated the photographs of these two items. See links above. 11.05.2014 – Note an EL Silver Jubilee 1977 piece is on eBay – this has the EL Wave mark.